Social Learning and Cognition examines the cognitive mechanisms of social learning and the social learning determinants of cognitive competencies. The explanatory principles of social learning are applied to the highest manifestations of human intellect: judgment, language, and thought. The book also explicates a social learning perspective on the social origins of complex abilities, and how these progressively evolve as children grow older. 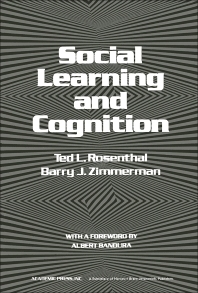 Comprised of four chapters, this book begins with a discussion on the interrelationships among cognition, behavior change, and social learning. Cognitive explanations for human behavior, and the kinds of evidence cited by cognitive theorists in support of their position, are considered, along with the major psychological theories that address abstract, rule-governed activities. The second chapter deals with children's acquisition and refinement of language, paying particular attention to the objections and misunderstandings raised by psycholinguists to counter modeling explanations of language learning. The third chapter examines relational judgments and categorical decisions and presents evidence showing that diverse modeling procedures can be powerful influences on language and verbal behavior. The final chapter summarizes and integrates research bearing upon the effect of modeling influences on a wide diversity of conceptual activities, ranging from the formation of simple concepts to elaborate intellectual demands that involve complex styles of reasoning and strategies for seeking and organizing information. This monograph is intended for advanced undergraduates, graduate students, and professionals from such diverse fields as child development, social psychology, psychiatry, social work, clinical psychology, education, and rehabilitation.